"Typically someone hates you when you beat them badly in the courtroom, but her opponents still love her. It just doesn't happen in our profession. It's great for her clients." So said one of Mo McGlynn's clients when asked to comment after Mo received a 2010 Women's Justice Award for Trial Practitioner. Following advice imparted by her father many years ago, Mo strives to be the most prepared attorney in every situation. She combines this studied preparation with a strong sense of humor and genuine concern for the welfare of others to achieve excellent results. 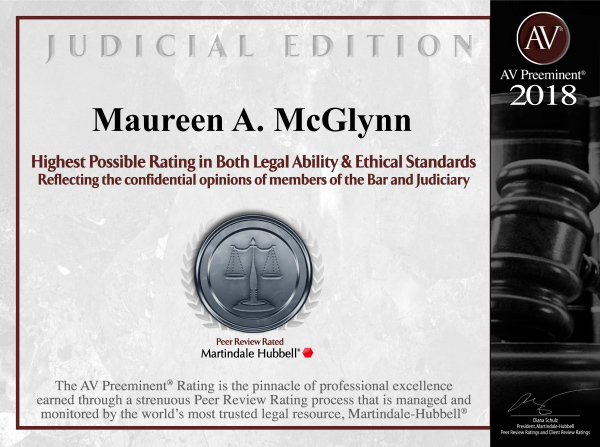 She has successfully tried dozens of cases in the areas of products liability, premises liability, and toxic tort, and routinely gets rave reviews from judges, clients, and even opposing counsel. Mo currently volunteers at an agency that takes young mothers and their children off the streets, offering them safe temporary housing, while preparing them for successful lives. Mo teaches Life Skills classes there, and helps the residents with academic tutoring so they can earn high school diplomas. In the recent past, Mo spent many years serving on the Board of Directors at St. Patrick Center, an agency dedicated to ending homelessness, including a year as Board President. She has also been a running coach for school age girls, and she continues to serve on the Executive Board for the St. Louis St. Patrick’s Day Parade. In addition to her professional and civic responsibilities, Mo remains actively involved in the lives of her three children.